I just can’t begin to say how pleased I am with the service we have received. My sister has subscribed to your service for almost 2 years now. The local staff is MORE than pleasant, and truly care about all of us, not just the patient, but her loved ones, as well. I would like to tell you some things about having a medical alarm system. I had heard about them for years but never thought about getting one. My son and nephew changed my mind, they said, “You are getting one!” My nephew contacted Around the Clock Medical Alarms. When I called them, they explained all that it could do for me, so I decided to take it. Just to let you know, I consider them wonderful friends now. As a family, we packed up and traveled two hours north to spend time with grandma for Christmas of 2012. Spending the day with Grandma was wonderful… Our children (her great grandchildren) love the special “grandma toys” that are always there. When she fell, it wasn’t a two year old knocking her off balance, nor was it one of the special grandma toys — She fell on a 6 inch step from her living room to her kitchen. A step she takes every day of her life. Thankfully, she caught herself on the counter hurting her head and forearm. More forearm then head; no broken bones; big bruise on her forearm. It scared all of us. She brushed it off and said she was fine, as she always does. We (my wife and I) discussed it and our concerns on the way home. She lives alone and doesn’t move around as well as she used to. Without giving her a choice, we purchased the Around the Clock medical alarm package and have the peace of mind to know that when we aren’t there and IF she falls again on that step like she did… she has help available, anytime day or night, if she can’t get up…. I strongly endorse Around the Clock Medical Alarms. I am a gerontology specialist and have looked at alarms like this and this company offers the best product by all I have reviewed. I bought one of these for my mother who is 82 and lives alone. She feels much safer and so do I knowing she has a way to call for help if she fell or became sick suddenly. This alarm can be used for all kinds of medical conditions like persons with head injuries as well as other conditions that may predispose them to falling. The best thing is this is a nationwide company but the owner is from the Cape Girardeau area. In addition, the product is made in the USA. For those of you in the sandwich generation of caring for your children and parents, you need to consider this to offer you a peace of mind if anything! It has helped me tremendously with knowing my mother has method to get emergency help with just the touch of a button. If keeping your loved one safe at the cost of just under a dollar a day, then this product is for you. I just can’t begin to say how pleased I am with the service we have received. My sister has subscribed to your service for almost 2 years now. It was a difficult decision to make for her because she is only 49. But having brain cancer, she realized what a comfort it is to her caregivers to know that she is “never alone”. The local staff is MORE than pleasant, and truly care about all of us, not just the patient, but her loved ones, as well. Around the Clock Medical Alarms — Peace of Mind at the Push of a Button. Personal emergency response systems allow you to live the independent lifestyle you want. Around the Clock Medical Alarms’ medical alert systems provide you (and your loved ones) peace of mind at the push of a button. Our response center staff is available 24 hours a day to respond to emergent, or non-emergent, calls. Around the Clock Medical Alarms’ medical alert systems help thousands of people regain the sense of independence they once enjoyed, by providing the most comprehensive personal emergency response systems available. Around the Clock Medical Alarms’ emergency medical alarm service possess all the features of other popular systems on the market. However, our unique two-way speaker picks up sounds that others don’t, meaning that no matter where a subscriber is when the panic button is pressed, our operators will be able to communicate with them and send help quickly. 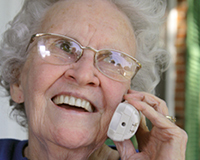 Senior alarms grant independence to those at risk for injuries and accidents, allowing many to continue living at home, when they otherwise wouldn’t be able. Family and friends are also given the freedom to leave their loved one alone, with the reassurance that they will be contacted immediately, if an incident occurs. Medical alerts offer a great sense of relief, providing a way for trained medical professionals to be notified of an incident – simply at the push of a button.